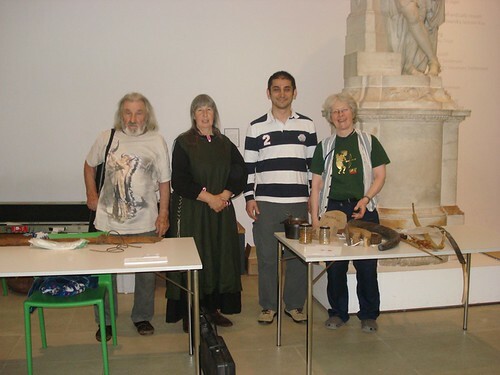 On the 28th of July 2012, a Longbow and Traditional Archery Day took place at the Ashmolean Museum in Oxford. Being a member of the distinguished Tirendaz Archers, I was invited to this event a few months earlier by SPTA founder Hilary Greenland, to talk to visitors and enthusiasts about Turkish Archery. When we entered the museum we saw that Hilary had already had set up the bow making workshop and information stand with Mick and Carol Pearce. Hilary had even set up a separate table for me, covered with tools and materials such as horn and sinew, that would help me describe the process of Turkish bow making. I made my addition by placing my strung bow, my quiver and the brochures about Turkish Archery I had printed. I had just talked to the first few customers of the day when I realised that we were actually late for Hilary’s talk. We rushed to the seminar room and listened to the remainder of her speech. Hilary had added a few slides of Longbow use in non-English cultures at the end of her presentation. What was especially interesting in those slides was that the drawing techniques were also quite similar to the English technique. Another bonus of the day Mark Stretton accepted Hilary’s invitation to the event. Mark is not only the current Guinness Book record holder in drawing the heaviest (200lb) English Longbow (http://www.guinnessworldrecords.com/records-1/heaviest-longbow-draw-weight/), he also is an awe inspiring person with his knowledge on the subject. It was an absolute pleasure to watch the slow motion videos of the armour penetration tests they made with Hilary. Mark has also made penetration tests on moving targets over various distances including long range. Because I do not know the publication status of that work, I will not comment further, but – let me say that the penetration/distance graphic is very intriguing. The attention given to authenticity of the armour and the effort that went into building a moving target also needs to be appreciated at this point. The armour was built by Hector Cole by sticking to medieval techniques and materials. In order to create an approaching mounted knight, the armour was placed on a four wheeled motorised vehicle and driven via radio control towards Mark. For the remainder of the day, while Hilary was occupied with her bow making workshop in another room, me, Carol and Mick took care of visitors passing our stand, placed strategically under a giant statue of the Greek Archer god Apollo. While western archery including American was explained at one end of the table, I shared my knowledge of Asiatic, Turkish and Ottoman archery at the other end. I must stress that my experience of instructing archery enthusiasts at the Maltepe Stadium in Turkey helped me a lot during the day. The only time I remember getting stuck was when I was asked about crossbows. Regardless, I think I have done a good job by sufficiently responding to the sincere and constant interest of people. The general feedback we have received from museum staff later was also complementary. In fact, the event went down so well that Hilary has been asked to organise a second one, although the time is not set yet. Towards the end of the day I had a chance to talk to one of the curators Alison Roberts. When I mentioned Mehmet the Conqueror to her, she told me that there was a medallion with a depiction of him in the museum and kindly took me to where it was displayed. I did not forego the chance to take a picture of it. While I was busy at the stand the whole day, my dear wife Yonca was kind enough to take pictures of me and the museum. If it was not for her, we would not be able to have an idea about the collection and displayed items in the museum, since I was only able to leave my place twice; for lunch and a 10 minutes stroll through the museum. I am very grateful for her contribution. After helping the packing up, me and Yonca said goodbye to everybody and went for a very short tour of Oxford. We also found a small cafe where I smoked my pipe and drank beer while she opted for a cappuccino and cigarettes. I would like to take this opportunity to thank the museum staff, especially Jude Barrett and Alison Roberts, for not leaving us unattended throughout the event; Mark Stretton, for sharing his knowledge and experience; my team mates Mick and Carol Pearce, for making the day even more fun than it already was and finally Hilary Greenland, for enabling the promotion of Turkish Archery at an important venue such as the Ashmolean Museum by inviting me along.